The Japanese Pattern Challenge: Happiness is..... The completed safari jacket! All the loose threads are clipped. All the buttons are sewn on. 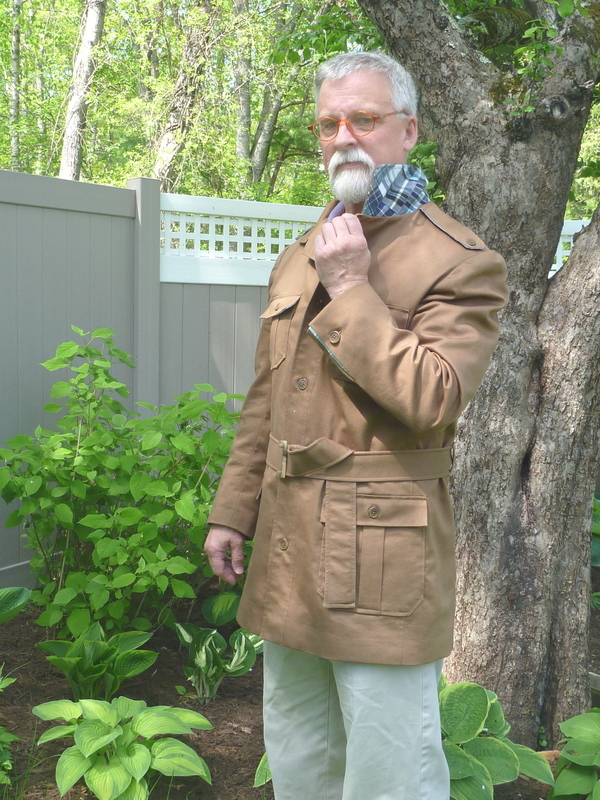 The sun is shining so it's time to get outside and model the circa 1975 safari jacket. 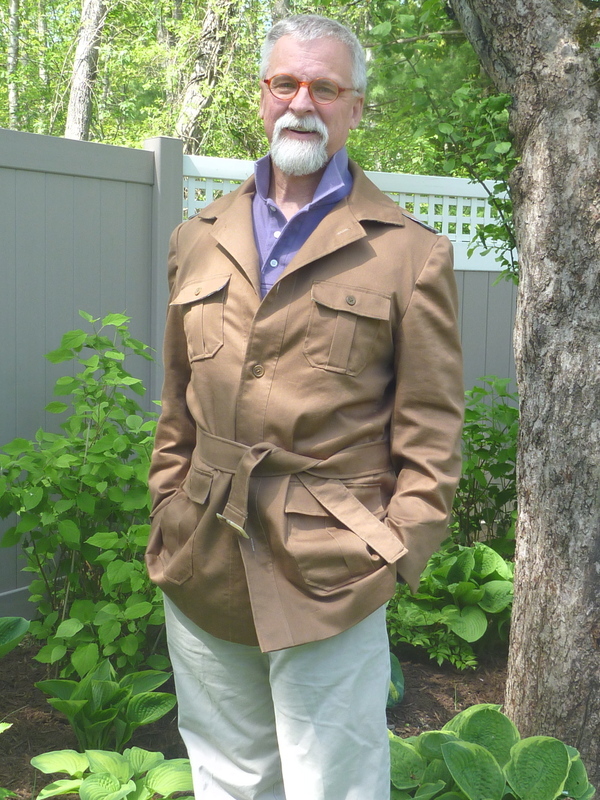 I'm a happy guy in my new safari jacket! Simplicity 6887 with a few modifications here and there. The pattern had a HUGE disco collar that I whittled down. I also replaced the button cuffed sleeves with a two piece vented sleeve. The undercollar , back vent and sleeve vents have contrasting fabrics. Here you see the patchwork madras at the collar and back vent. 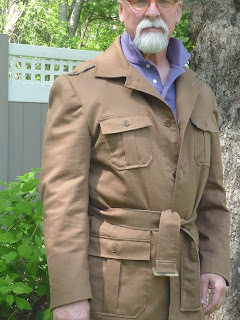 I know a lot of people think "ick" at the idea of a safari jacket, but it really turned out more like a mini trench coat in my opinion. It's a versatile color for me and goes well the the purples, olives, aqua and peach that make up the bulk of my wardrobe. I'm not totally thrilled with the set of the sleeves, but for a casual jacket it's OK. There's a substantial amount of lycra in the fabric which just doesn't want to "relax" no matter how much I press. It's been a good lesson learned and I'll keep it in mind when shopping for fabric in the future. I'm going to be putting the sewing machine away for a bit while I work on building a backyard fountain. Happy sewing to all of you! wow, that looks amazing!! i have plans to make a trench for myself and i *also* have plans to come back and reference your posts on this (and other) jackets for tips! Great jacket, and so not a 70's look. The contract facings are a great touch. Very much a success, IMHO. Looks great! I really do admire the hard work and patience you put into it. I am very impressed. I actually have the same pattern and I'm from Maine too! Maybe it was popular up here. I think it looks very smart. Good changes! Very nice jacket. I especially like the contrasting fabrics and very much appreciate the details and care you took in constructing it. I'm inspired to go sew something today! Thanks! Hi Mainely Dad! 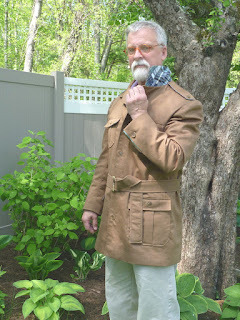 I am from Maine, sew clothing, and like safari jacket style. We have three things in common already! Nice work! I think it looks great and I love all the little colorful touches you've made. I like safari jackets. Norfolk jackets, too, if you're ever inclined to do one of those. This is SO hip! I love it! Nicely done, sir! Love it. And with regards to "safari jacket" I thought cool. The jacket is wonderful and looks amazing on you. Well done! You sew so meticulously and beautifully. I love the madras and striped facings. It is a snazzy jacket indeed. That jacket looks AWESOME! And just shows you how sometimes you have to look past the pattern envelope illustration and see the details! Great looking jacket! 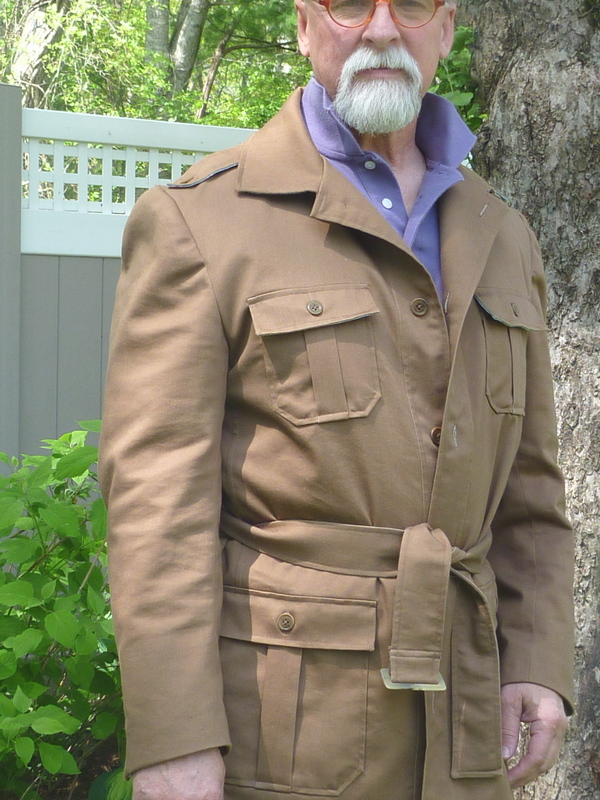 It brings back memories of the safari jacket I had in the early 80s. Wow! Your jacket turned out great - very dapper! 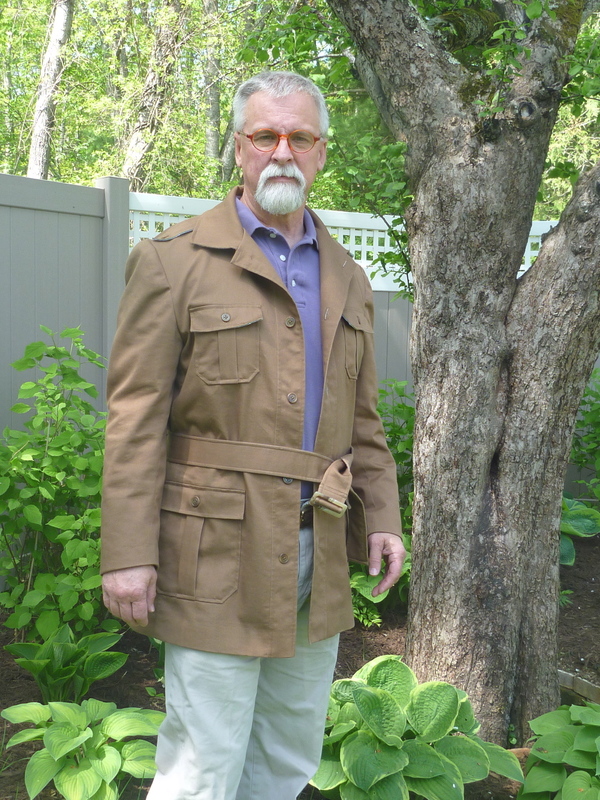 I really appreciate how you really showed the process for making this jacket, from bed-sheet muslin + Saturday night fever collar to a very appropriately modified safari/trench hybrid with nice contrasting fabric details. Awesome job sir! My goodness, this is spectacular! I love safari jackets and I think they're actually pretty timeless. Your colour choice is perfect and I agree that it goes well with so many other colours. I love the madras contrasts and I'm impressed with your lovely handsewing. 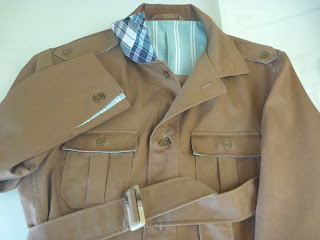 Being a man of a certain age, that of the Disco 70's era, I think a Safari Jacket is cool. Only two thoughts: what about mitering the pocket flaps to match the pockets? And there is too much ease in the sleeve cap, it's starting to look like a pleated cap. 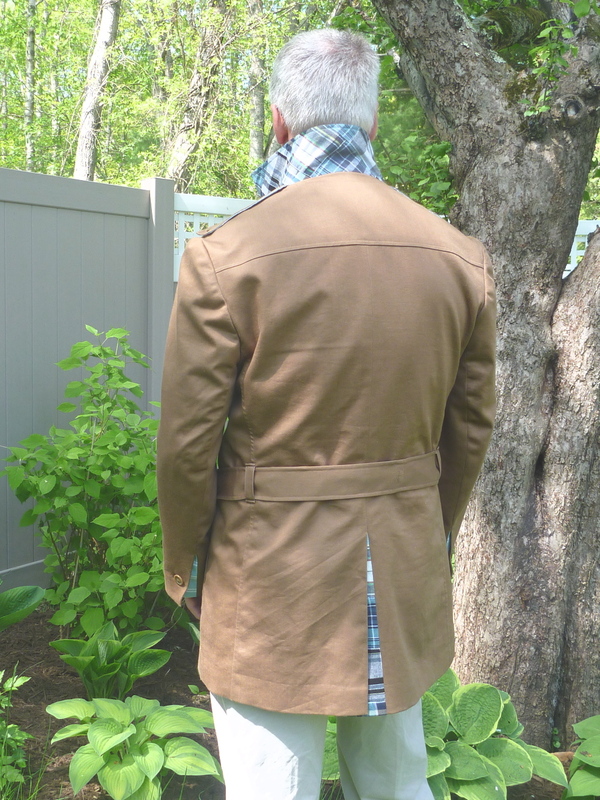 Rule of thumb on a casual jacket , especially non-woolen fabrics, is to have almost no ease in the cap.